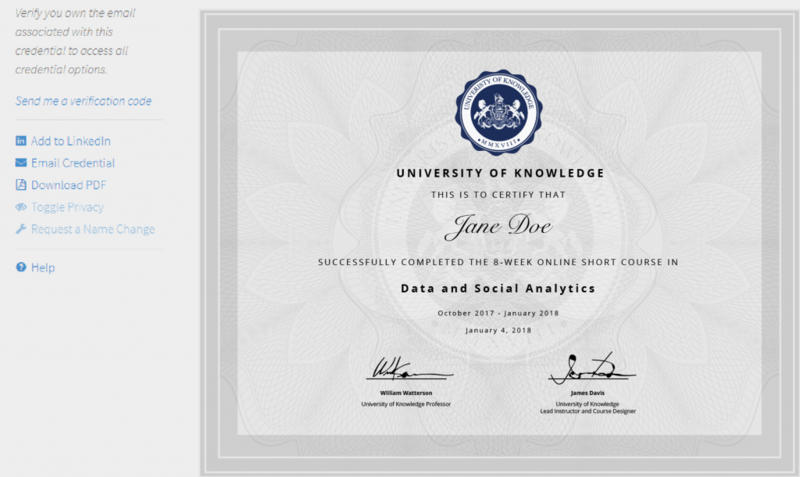 So, you’ve successfully completed your online short course with one of the world’s leading universities, in collaboration with GetSmarter. Why not share your accomplishment with the LinkedIn community to boost your professional presence and promote networking with like-minded professionals? This is made easy with Accredible1 – a trusted platform used by many of the world’s leading brands – which transforms your physical certificate into a digital format for use on any online platform. 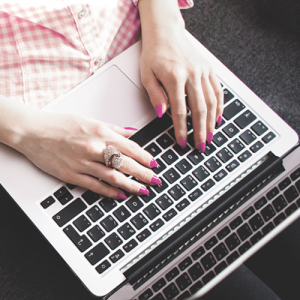 By adding your certification to your LinkedIn profile, you’re showcasing tangible proof of your established skills and knowledge, helping you stand out from the crowd. Haven’t got your LinkedIn profile up and running yet? LinkedIn is not your run-of-the-mill social networking site. With a clear focus on helping professionals showcase their skills and achievements, LinkedIn is a free service allowing you to network with like-minded individuals within your industry, search for career opportunities and build your online professional presence. LinkedIn operates the world’s largest professional network on the internet with more than 530 million members in over 200 countries.2 Share your achievement with your LinkedIn network and join a powerful community of global professionals. 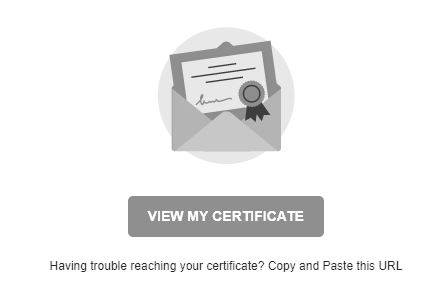 1) Click on the “View my certificate” button in the digital certificate email you’ll receive upon successful course completion. 2) Once loaded, see the tab to the left of your digital certificate and click on “Add to LinkedIn”. 3) A pop-up screen will open and your certificate credentials will be populated in the required fields with your course name and University name. 4) Click on the blue “Get Started” button in the bottom right corner. 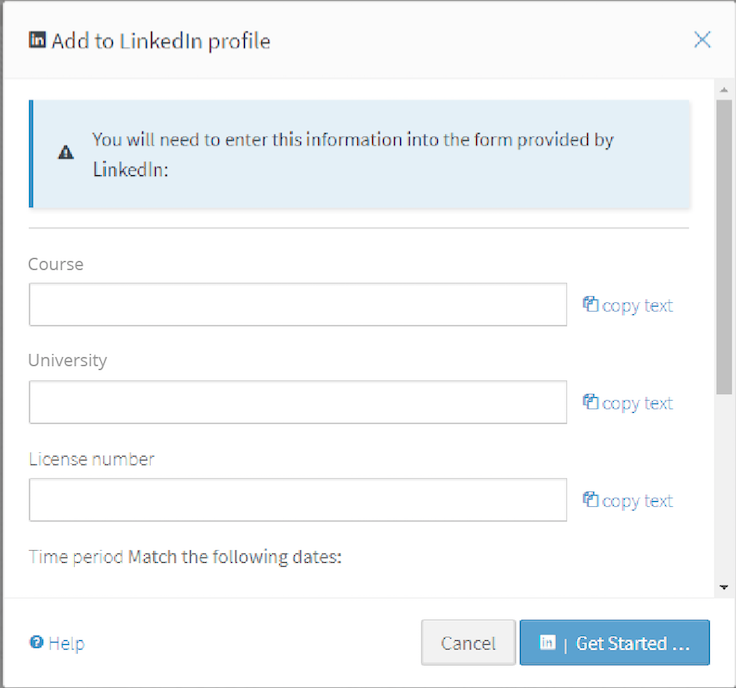 5) This will take you to your LinkedIn profile where you’ll need to fill in your credentials as per the credential pop-up screen. Don’t forget to add your presentation time period. Once you’ve filled in all the required fields, click ‘Save’ and your digital certification will be added. 6) When you’re done, check that your accomplishment reflects properly on your profile and then join the New Professionals Network by GetSmarter to connect with fellow short course students from the world’s best universities.